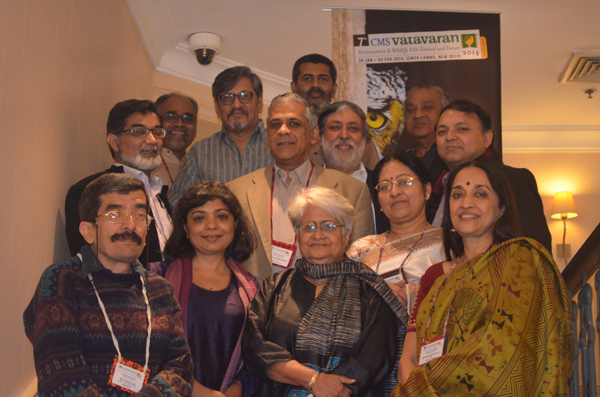 The Award Jury Meeting of the 7th CMS VATAVARAN- Environment and Wildlife Film Festival & Forum was held from Dec 18 - 20, 2013 (Wed - Fri) at the ITC Maurya, New Delhi. Eminent film maker, actor and producer - Shri Amol Palekar headed the list of eminent jurists for the coveted 7th CMS VATAVARAN Indian Awards. Mr Ramesh Sharma, award-winning filmmaker chaired the jury for international awards. The Jury comprised of 13 eminent personalities from widely divergent sectors and streams representing environment & wildlife, film, media and communication. The awards in Indian category range from INR 50,000 to 1, 50,000 each along with citation and trophy. Similarly, the awardees in the international category will also receive trophy and citation. In this 7th edition of CMS VATAVARAN, a total of 541 entries were received in both Indian and International categories. In August 2013, 86 films were nominated in 11 categories by the Nomination Jury of 31 experts headed by Mr Srinivasan Iyer, Assistant Country Director and Head, Energy and Environment Unit, UNDP India. Known for its rigorous and credible selection process, the coveted CMS VATAVARAN awards will be announced and presented on (Sunday) Feb 02, 2014 during the festival scheduled from Jan 30 - Feb 03, 2014 at IGNCA Lawns, New Delhi.